If you're looking for a chic way to showcase your bottles and beauty must-haves, you've come to the right place. This 6 tiered rack is the ultimate nail polish holder to display style and organization to your wall of choice, all in one place. 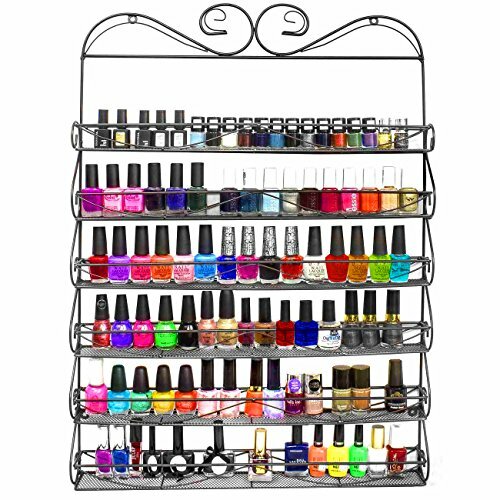 Since there is no standard size for nail polish bottles and each brand has their own signature shape, this nail polish rack is the perfect solution to accommodate an assortment of polish/lacquer sizes and brands. Popular retail brands plus many more can now easily be displayed in your nail collection. In addition to nail polish and laquers, store your acrylic supplies and feature this as an acrylic cosmetics holder. Make life easy and simple with a convenient wall display and create functionality by easily finding your bottles when you need them. No more "caboodle" cases, individual cubbies for the polish, stuffing bottles in bins under the sink, or using cheap plastic organizers. Unlike other inconvenient storage options, the bottles slide right in the nail polish organizer with ease. Constructed of sturdy high quality metal, in black, and can be quickly installed. Setup the nail polish rack with the option to hang on a wall or mount with nails via two round installation holes in the upper corners. Holds at least 72 nail polish bottles. Measures approximately 20.25" L x 2.25" W x 28" H. (Please note: nail polish bottles are NOT included).